The first time I got satellite TV I installed it myself on the balcony of my apartment. I really didn’t think I would be able to do it at first. It seemed like such a daunting task to aim that little dish at an invisible speck somewhere above Texas. Amazingly, a compass and a wrench was all that it took. Only a few days left for The Book of Biff #4 preorder sale! I remember when I first got satellite TV 5 or 6 years ago. I was so use to cable and having to actually be at the TV when a new episode came out that being able to record shows was just the most azing thing I’ve seen. The only problem is that whenever it gets windy the picture is knocked out. That’s one heckuva tether! It’s like taking your very own moon for a walk! Hmmm . . . I don’t think a bow and arrow would shoot far enough . . . He should get a crossbow. Very nice. Took me a minute to figure it out. @Shorty and Space Butler: Compound Bow. More draw = longer range. I miss the days of my BUD (Big Ugly Dish). The 8 foot behemoth which could be pointed at over a dozen different sats. We got the network feed channels, so I got to watch every episode of Babylon 5 a week before it aired without commercials. Weather, the only problem was ice that kept the motor from pointing the dish, and it took a lot of ice to do that. well well, biff has solved another problem, getting your keys from across the room. i can imagine him having some obscure mettalic object in his pocket that when he shot the arrow, it went back to him. I’m not sure it matters what kinda bow he uses. Biff has apparently decided that this will work, ergo it will work. A llama farm near my house has a huge BUD painted as a smiley face. No wonder the llamas are always happy. @Malachite Dragon: I actually know someone with the last name Bowman. On a side note, I haven’t had a TV ever since my family moved to the US 10 years ago. Um, I don’t get this one. 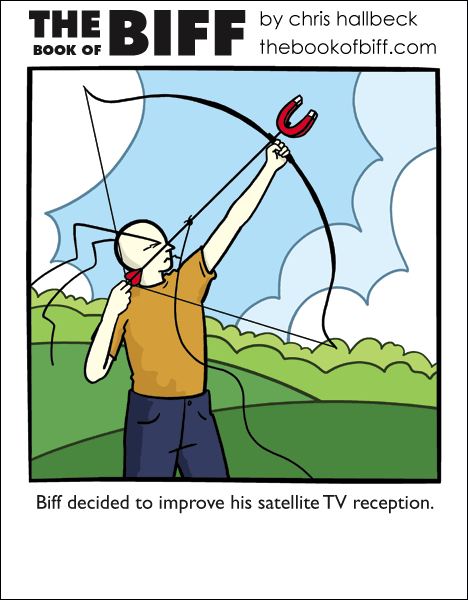 What is Biff targeting? His satellite dish? Or actual satellites? Would not magnets screw all the electronics on either telecommunications hardware? @Gelugon: Depends on whether or not the electronics are specially shielded against magnetic fields. Some are, some aren’t.